A prototype of a next-generation X-ray scanner that has been developed using technology created at Cranfield University is predicted to lead to a revolution in security in the aviation sector. X-ray technology is central to protecting the lives of millions of passengers and air crew. However, terrorist threats continue to evolve and challenge the technical capability of existing systems. The technology currently used in airports has its limitations: X-ray scanners will give images of objects and a broad material category, but they can't tell you definitively what substance an object is made from. This can lead to increased false alarms and a need for further investigation by hand that slows down security checks. 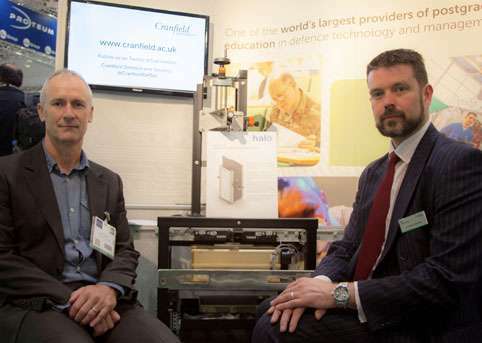 Cranfield University, working in partnership with Nottingham Trent University, has developed a scanner that, in a matter of milliseconds, will identify whether a substance is, for example, an explosive or an illegal drug. Professor Keith Rogers, head of Cranfield Forensic Institute, has used his background in crystallography (determining the structure of large biomolecules) to develop a technique that uses the way an object diffract X-rays to identify what substance an object is made of in approximately 100ms. He said: "This is an exciting application of a traditional laboratory method for identifying materials. The technique is a simple and low-cost solution to the longstanding problem we faced; producing data and results was taking so long, the technology could not be used in the real world. However, Halo's elegance brings smiles to the faces of all my colleagues in our field!" As a result of this research Cranfield and Nottingham Trent have set up Halo X-ray Technologies Ltd, a joint company created to develop and exploit this licensed and patented technology. This month it has created its first prototype to scan mobile devices for any prohibited substances. Halo CEO Simon Godber, who has more than 23 years' experience in the aviation security industry, said: "Halo's 'focal construct technology' will revolutionise X-ray scanning at checkpoints. We will be able to dramatically increase the speed at which items such as smartphones and tablets can be checked. "Halo's platform technology also has the potential to be exploited commercially in many ways and further work is currently underway across a broad range of areas. This includes bone density measurements for medical applications and assessing what processes or problems are taking place in production lines."